Did you know that Smokey Bear, along with his trademark, “Only You Can Prevent Wildfires,” has helped reduce the number of acres lost annually to wildfires from 22 million to an average of 6.5 million annually today? Nine out of ten wildfires are started by humans, and Smokey Bear still plays a key role in educating the public about how to prevent wildfires. Smokey Bear, the icon featured in the longest running public service campaign in U.S. history, turns 70 years old this Saturday, August 9, 2014. Created in 1944 by the U.S. Forest Service, the National Association of State Foresters and the Ad Council, Smokey Bear, along with his trademark, “Only You Can Prevent Wildfires,” has helped reduce the number of acres lost annually to wildfires from 22 million to an average of 6.5 million annually today. To commemorate Smokey Bear’s seven decades of impact, the U.S. Forest Service will be hosting a birthday party in Washington, D.C. at the USDA Whitten Patio from1pm- 3pm ET on August 8. USDA Under Secretary Robert Bonnie, U.S. Forest Service Chief Tom Tidwell, Ad Council President and CEO Peggy Conlon, New Jersey State Forester, Lynn Fleming and Smokey Bear himself will be in attendance for the festivities. Smokey Bear was first created during World War II out of fear that enemy shelling would cause forest fires out west while most firefighters were busy overseas. By 1952, Smokey’s popularity had grown so large that he was taken out of public domain, protected by under U.S. federal law and was given his own zip code as a place to receive and collect fan mail. That zip code, 20252, re-launches today in celebration of his 70 years. Actor Sam Elliott, known for movie roles in Roadhouse, The Big Lebowski, andTombstone, has served as the voice of Smokey Bear since 2008 and coincidentally shares the same birthday, turning 70 years old as well on August 9th. This past April, the campaign released new public service advertising (PSAs) to commemorate Smokey’s 70 years. Created pro bono by FCB West, the new TV, web, print, radio and outdoor ads reward and thank those that take steps to help prevent wildfires, Smokey is giving out bear hugs online, using #SmokeyBearHug. In recent years, Smokey has expanded his presence online, cultivating robust communities to communicate his wildfire prevention messaging. In addition to his website,www.smokeybear.com, Smokey also has a large following on Facebook, YouTube,Instagram, and Twitter for more information about wildfire prevention. Celebrations continue online, including a digital birthday card allowing users to leave a congratulatory message or picture. Beginning this week, Instagram has committed support to the campaign, featuring new Smokey-centric ads incorporating images of fire safety actions. 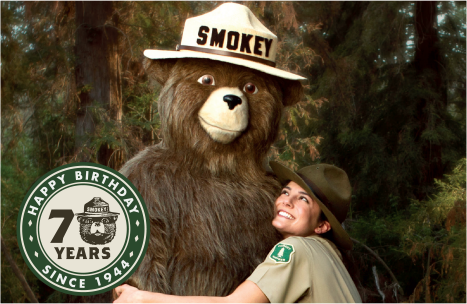 Fans and followers are encouraged to share their memories and well-wishes for Smokey on Twitter using #SmokeyBday, or giving their own #SmokeyBearHug. 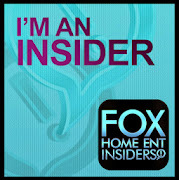 Awesome, thank you for sharing, Kimberly.